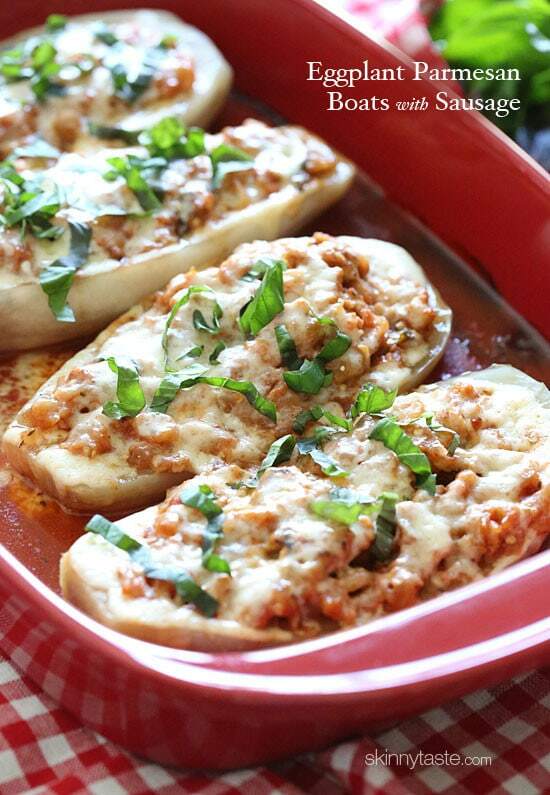 Stuffed Eggplant Parmesan is a fun, easy twist on eggplant parmesan – these baked eggplant “boats” are hollowed out and stuffed with chicken sausage, tomato sauce and mozzarella. I’ve been dreaming up this recipe since last year when I created my Sausage Stuffed Zucchini Boats. If you love eggplant parmesan these are going to knock your socks off! My husband loved these even more than the zucchini actually, but he’s also more of an eggplant guy. These are easier than making traditional eggplant parm because they use no breadcrumbs, and there is no breading and frying! Look for medium sized eggplants, white or Japanese would be perfect here. You could use any variety as long as they aren’t too large. The pulp that gets scooped out goes right back into the stuffing so nothing gets wasted. One boat is a complete meal and super filling, you can also serve it with a side salad if you wish! 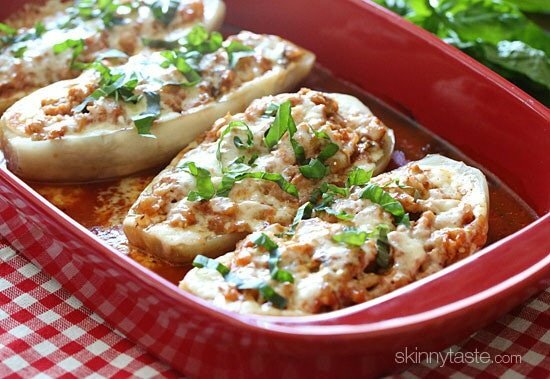 A fun, easy twist on eggplant parmesan – these baked eggplant “boats” are hollowed out and stuffed with chicken sausage, tomato sauce and mozzarella. Hollow out the flesh of the eggplant to create a boat using a melon baller or small knife, leaving a 1/2-inch of the skin all around to create a shell. Roughly chop the scooped out eggplant flesh. Drop the eggplant into the boiling water and cook 3 minutes (poking it with a spoon so they stay submerged). Remove with a slotted spoon and set them on paper towels on the counter. Meanwhile, brown the sausage in a large skillet over medium-high heat, breaking the meat up while it cooks into smaller pieces. Add the onions and garlic and cook on a medium-low heat for about 2-3 minutes, until onions are translucent. Add 1 cup chopped eggplant and cook about 2-3 minutes. Add 1 cup crushed tomatoes, season with salt and pepper and cook 2 to 3 minutes. Remove from heat and stir in fresh basil. 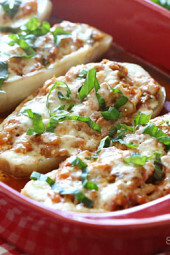 Pour 1/3 cup of crushed tomatoes on the bottom of a 9 x 12 baking dish and place the eggplant boats on top. 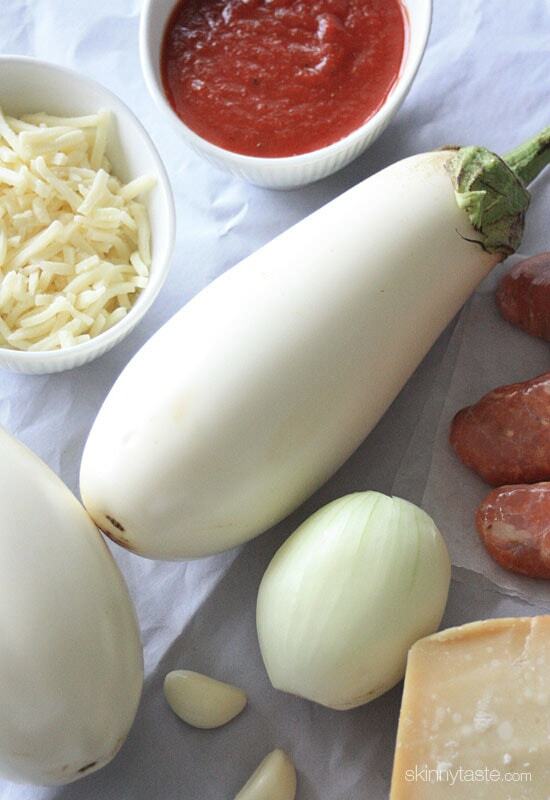 Season the eggplant with salt and divide the sausage and sauce evenly among the 4 eggplant boats. Top each with 2 tablespoons of shredded mozzarella cheese and 1 teaspoon each of Pecorino Romano cheese. Cover with foil and bake 30 minutes until cheese is melted and eggplant is cooked through. Where is the Parmesan? I was planning to make this, but there is no Parmesan in it. Shouldn’t it be called Stuffed Eggplant Romano or maybe Stuffed Eggplant Italian Style or something? The title for this recipe is misleading..
Looks Delicious!!! I love love eggplant but not a fan of the skin. Could you possibly remove the skin after boiling the boats? Made this quite a few times, absolutely love it, it’s a change from the “norm” a bit of messing, but….I’ve always used beef mince instead of sausage meat, makes it much better. Although not done it for a while, have to get recipe “out of mothballs “Great,if you’ve got the time. Worth doing !!! This is such a ymmy recipe. I’ve made it twice now, and even my husband likes it, and he’s not much for veggies. Thanks for another great dinner option, Gina! Excellent! We made it with half sweet and half spicy chicken sausage. This is definitely a repeat! Love your recipes Gina! Made this recipe for dinner tonight. Delicious. My store didn’t have white or Japanese eggplant and Italian chicken sausage, so I used regular purple eggplant and sweet Italian turkey sausage instead. Otherwise, followed recipe exactly. My only comment is that prep time is closer to 45 minutes, so plan ahead. Sounds delicious – similar to spaghetti squash recipes I’ve made. But most eggplant recipes I’ve read/made suggest “salting” the eggplant prior to cooking to remove some of the moisture. Is moisture not a problem when it’s cooked this way, especially when boiling the shell? Thank you. OH MY GAWD – SOOOOOO Delicious. Tweaked a bit because we only had 1 eggplant (for 2 of us) so a few more SP but well worth it (used 2 sausages instead of 1-1/2). Thank you so much for the wonderful easy to follow recipes that are stupid delicious. As we were eating it we were brainstorming about making it taste like Sheik al Mehsheh by using our ground deer (really low fat and has a lamb like flavor) and the seasonings. Can’t wait to use your awesome recipe for one of our favorite dishes (that is too high in fat made the original way). Thank you again for all you do to make our weight loss journey tasty and easier. OMG this was awesome! Kids liked it. A huge delicious hit. Only change was I cooked the scooped out eggplant starting 5 minutes before adding the sausage to the skillet rather than boiling it. This recipe was fast to make and easy. Loved it! Had eggplant, tomatoes, onion and basil in the garden…so timing was perfect. Thanks for another great recipe. Absolutely delicious! I made it as suggested, boiling the boats and I think it was just perfect. Thanks!! Do you have to boil the eggplant? Won’t it cook in the oven? You don’t boil to roast? Just wondering. Is the step necessary. Would hate to skip the step and have the eggplant uncooked. What can I substitute for sausage that is not meat? You can always leave it out, or maybe try mushrooms? I made this tonight and it was so good! Very filling. Thank you! I have made a TON of your recipes because you have the BEST ideas. And I love the WW points! BUT this is the only recipe of yours that I made and wasn’t crazy about. To my husband and I the eggplant “boats” were just basically bowls that held the meat sauce. I felt like I was just eating forkfuls of meat sauce. And we agreed the Italian Chicken sausage AND your Quick Marinara sauce were amazing and I will absolutely make again. Only next time I’ll make it to serve on top of zoodles. The actual eggplant boats were sort of pointless in this recipe, in our opinion. But the meat sauce and your quick marinara were fantastic! I’m a workaholic and busy body and I am rarely home. I’m either on my way to something or at the office working. How would you recommend we preserve this meal without it getting soggy or losing its ✨? Also how do you reccomend it be reheated? And stored? This is great cooked then reheated the next day for work stored in the refrigerator in a plastic container. Oven or micro would be fine. would this be ok to prep the night before and cook the following? Not sure how the eggplant will be, any thoughts? I think it would be fine! This was delicious! I used purple eggplant, spicy Italian turkey sausage and used up some fresh mozzarella I had in the fridge. I do agree the eggplant boats could be made closer to 1 inch thick, or possibly only blanched for 1-2 minutes, to better hold their shape. But as is, this recipe tastes great and has good texture – so it probably doesn’t really matter. Thanks – very filling and enjoyable! This was absolutely DELICIOUS!!! I do not like basil so I replaced it with oregano and used fire roasted tomatoes. This is now a staple for my monthly food rotation! Got the Roasted Balsamic Chicken and Veggies in the oven now! Cant wait to eat it! Thanks for a fantastic recipe! Wonder if you could twist the recipe and use ground turkey instead of sausage for a different flavor? What’s a good side to pair this with? Is there any difference or advantage using white vs purple eggplant if both are available? This sounds delicious and can't wait to try it. Thank you so much for updating the Smart Points on this so quickly! 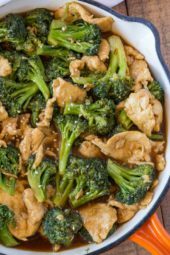 My weigh-in day is tomorrow and I've been searching your site for recipes that will help me ease into the new plan. A 4 point dinner entree, paired with a salad, I can do! Absolutely delicious! I cooked up a whole package of Trader Joe's Sweet Italian Chicken Sausage and used extra chopped onions and extra garlic. I set aside half of that mixture for later. After I completed the recipe I sautéed the remaining eggplant in garlic infused avocado oil about 4 minutes then added a whole can of TJ's Diced & Fire Roasted Tomatoes with green chiles. Once that was cooked I added the reserved sausage, onion, garlic mixture and cooked until hot. I figure this will taste great with eggs, on cottage cheese, in a quesadilla etc. Such great flavors! Made tonight – OMG YUM!!!! I had to use turkey sausage due to store was out of chicken sausage and used regular eggplant. A DEFINITE Re-Do! This was great! Since I was making it just for me, I had a lot of leftovers. Re-heating it in a 350 degrees oven for 20 minutes (still covered with foil) worked great. Love it! Thanks for another great recipe. Thanks for so many good and good for you recipes! Why do you have to cover them in foil? Honestly, I don't even see the need for the blanching step. You're cooking them a half hour in the oven, and that should be plenty all by itself. I think I'll also add mushrooms like a previous reviewer, that sounds delish. Made these last night and added mushrooms–delicious! I'm definitely making these again. They're super filling, too! Fantastic idea! This is such a creative recipe and who doesn't love eggplant parmesan? I made them in advance to bring to the office for lunch. They reheat very well and are very filling for 7 points! Thanks again Gina! Made it with purple eggplant and it was a hit! SO DELICIOUS! One of my boats absorbed a lot of water and collapsed but it did not alter the flavor. Thanks for the recipe! I made this last night and it was amazing! The only suggestion I have to those who want to try the recipe: If you're unsure how much eggplant to scoop out, less is more! My eggplant boats didn't hold their shape well after I boiled them. It looked more like a casserole, but still tasted delicious! These were great! We like spicy things so I used hot turkey sausage (couldn't find chicken at my local grocery store) and it was fantastic! I had lots of chopped eggplant left over. Any ideas? I'm with you there, I put it in a baggy in the fridge and am hoping to find something else to do with it! You can add it to marinara sauce. Made this last night for dinner and was very impressed! I usually need to double the recipes to feed my family, yet I had some leftover turkey meat from a meatloaf I made the night before, so I threw in the remaining chicken sausage to make a healthy bolognese. 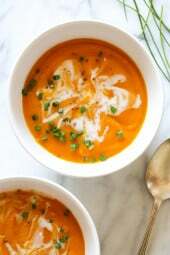 I served this over spaghetti squash, which was a perfect compliment to the eggplant! Absolutely delicious! This was so great! Kids even loved it and never made a peep about the eggplant. I made this last night and was so impressed with the flavor! One question-do you have any ideas on how to make the dish less watery? I used the crushed tomato but was thinking maybe adding paste, or draining some of the water first. Thanks for another great recipe! These came out so yummy! Love all your eggplant recipes because my garden is getting ready to explode with them! I made these tonight with a couple of changes. I didn't have any sausage, so I omitted it, and used fresh diced tomatoes instead of crushed. This was FANTASTIC! Thanks for another great recipe! These are amazing. 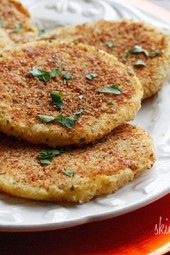 I have been looking for a replacement for fried eggplant parmesan. This is it! I did like Michelle and used purple eggplant and ground turkey. Even though I slightly screwed up and forgot to add the basil, salt and pepper until the last minute they still turned out great! Thank you for the recipe! THIS IS NOW A MUST-MAKE IN MY HOUSE. This was absolutely amazing. I wasn't sure whether or not to boil the boat part of the eggplant as well but I did (a little hard to work with so I'm not sure if that was the right thing). The only things I did different was using purple eggplant and instead of sausage I used ground turkey (which I had on hand). This was insanely yummy =) Thank you!!! Keep up the fantastic recipes – and amazing pictures! I made these last night and they were great! Even my non-eggplant eating husband really enjoyed them! Thank you so much. I made this last night and it was VERY delicious, I will definitely make it again!! Also I used purple eggplant because my grocery store didn't have white…would love to try with white in the future. And just when I thought I would never find another way to indulge in my favorite veggie! Just made these today, but with veggie crumbles instead of sausage. Very tasty! Thanks! I made these last night and it was great! I need to add some more spices next time to up the flavor, but it was great. I added green peppers for bulk (and because i love sausage & peppers). Will definitely make again! I made these and ended up using meatless sausage crumbles and they were wonder. Definetly have to make again! Even my boyfriend liked them and he's a picky eater. Thanks! Really enjoyed the flavors of this dish. Wondering if I just hollowed out my eggplant too much because boiling it for the 3 minutes turned it much too soft to really hold up in "boat" form…by the time I took them out of the oven, they were barely holding the filling… But still tasted fantastic! Nicki-I made these tonight and only boiled the "guts" that I scraped out. The boat portion will cook in the oven once you have filled it and covered with foil. As usual, another great dish. I didn't have white eggplant so I used purple. Was fabulous! Was trying to get my husband to change his tune about eggplant but no good. He did try it and said the flavor was good but just can't get past the texture of it. I, on the other hand just loved it. Thanks! Just finished dinner, WOW, this was very good. These look great! Trying them for dinner tonight, I couldn't find the white eggplant so I am using the purple. What a fabulous idea, Gina! These look wonderful! Wow! Can't wait to try these – I just made your Zucchini Boats tonight for the first time and they were absolutely delicious. My husband said that they tasted like something you'd order at an Italian restaurant that they call their "specialty". I'm sure these are just as good!! Dang! I wish my kids liked eggplant! Looks so yummy…. I was looking for eggplant recipes, and this showed up in my inbox today! Can't wait to try it this week. May be a silly question, but do you eat the eggplant shell, or just the filling from inside of it? I never use foil. Use parchment paper. It is much healthier. Aluminum foil has metal in it which will spread into your food as you cook it. I bake everything in glass pans or line with parchment paper. Your food will also taste better. If you only have old school foil on hand, you can tent the foil by puffing it up a bit in the middle. Yum- Looks great & I need lunch ideas. This would work. I pinned this! Looks incredible – esp with the addition of sausage! Thank you! Any chance these can these be frozen? They look amazing! How do you thin it would be with dairy free cheese? I've never had dairy free cheese but if that's something you normally eat them I would assume ok.
Hahaha you are a MIND READER! I have 2 eggplants at home that I MUST use ASAP! Guess what's for dinner! left out garlic b/c I'm out. I love eggplant, but I've never had white eggplant before. I'm going to try this. It looks to yummy to pass up. I'm going to stop by the farmer's market to pick up some yummy eggplants for this recipe! Cannot wait! Looks like another winner. I can't wait to try this one–it's on tomorrows menu. This looks so good to me. I have never had the white variety of eggplant. Can I use the traditional dark purple; or, is there is a reason behind going with the white? I mentioned above the recipe. yum, yum! i love eggplant – had it for lunch! Looks so good….I am allergic to eggplant, so I will use zucchini to make it tonight! this looks unreal!! trying this weekend. Do both the chopped eggplant and hollowed out eggplant boats go into the boiling water? Can't wait to try this! Just the hollowed out part. THIS MAYBE A SILLY QUESTION, BUT DO YOU PEEL THE EGGPLANT FIRST? DO YOU EAT THE SKIN OF THE EGGPLANT?? The skin is the healthiest part I read somewhere! !